Response to Intervention (RTI) is an educational approach allowing educators to succeed with all students. The RTI goal is to help students before achievement failure. Accurate student assessment is the starting point for successful intervention programs. Continuous progress monitoring is a core feature of the assessment program. The assessment data from the Pre-Test screening is used to make educational decisions for all students, small groups of students, and individual students. 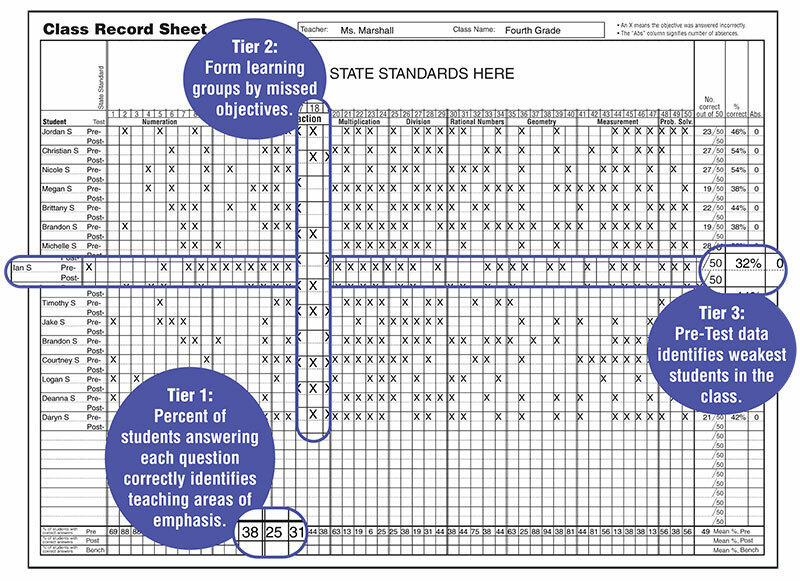 The Class Record Sheet and Student Progress Report completed from the Pre-Test results provide teachers assistance in planning instruction for all three tiers. Whole Group Instruction. Data from the Pre-Test is used to provide high quality instruction for multiple tiers in a whole group setting. Teachers use scripted lesson plans to reach students at different developmental levels and with different learning styles. Small Group Instruction. Students with the weakest skills are provided small group instruction to meet their needs. Students missing specific objectives may gather at learning centers for focused instruction and practice. Individual Instruction. A completed Student Progress Report helps create an Individualized Educational Plan (IEP) for one-on-one tutoring. The Student Progress Report highlights objectives that need more attention. Aides and volunteers directing the IEPs will appreciate the helpful guidance provided by lightly scripted, 1-2-3 step lesson plans. 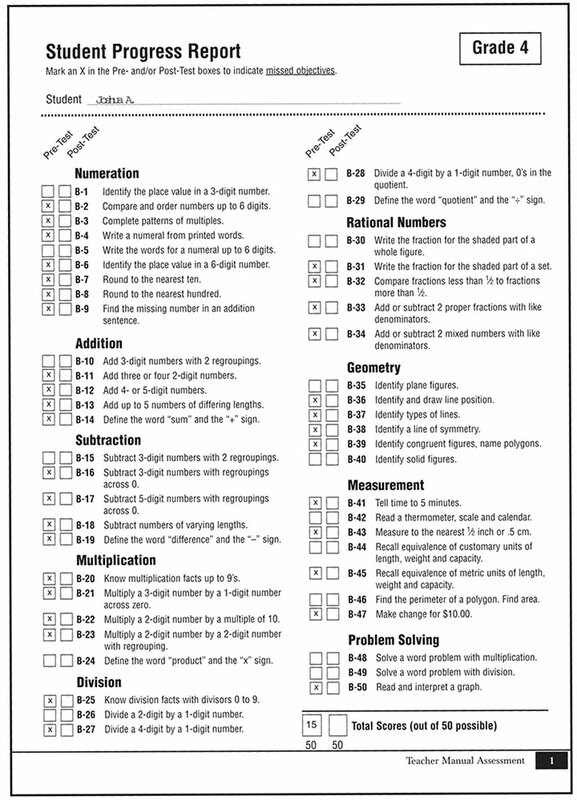 Moving with Math® programs are structured to scaffold new learning on previous learning. This interlocking structure makes it easy to frontload objectives that are too difficult for some students by placing those students in an earlier level of the program to build up their mathematical background. The What Works website www.whatworksclearinghouse.org recently released eight recommended best practices for Response to Intervention. The Moving with Math programs published by Math Teachers Press, Inc. integrate these recommendations. 2. In-Depth Instruction of Whole Numbers through Gr. 5 and Rational Numbers in Grades 4-8. Moving with Math integrates hands-on place value lessons and fraction lessons. Moving with Math contains easy-to-use, lightly scripted lesson plans. Moving with Math has explicit instruction on solving word problems in lesson plans. In Moving with Math programs, every lesson is introduced with a manipulative activity to develop understanding of essential math concepts. Manipulative lesson is followed with a picture on the student page, connecting the concrete to the abstract stage of learning. Moving with Math incorporates strategies for learning basic facts and Daily Reviews. Moving with Math integrates Daily Reviews and Journal Prompts to provide ongoing assessment to differentiate instruction and monitor progress. Moving with Math Lesson Plans are guided to provide successful, engaging, and educational experiences.